"I still can't decide what instrument I want to play in the marching band when I'm big. Or what I want to be for Halloween. Or when I grow up." Each morning upon waking, Ethan stumbles down the hallway. He is quick to slip out of his bed and turn his light on, seemingly disappointed in himself for having fallen asleep. He possesses the same sleep is a waste of time mindset that I have, although my own mind has admittedly started welcoming rest a little more the older I get. Life. It's funny that way. He stumbles out of his bedroom and announces his awakening with a hasty slam of his bedroom door. That's essentially the sound of our alarm these days, the slamming of his bedroom door before the quick pitter-patter of little feet on the tile get closer and closer. He's always groggy still, his hair sticking up all over his head, and he's usually clutching whatever stuffed animal he could grab on his way out the door. "Hi, baby! Good morning!" I usually meet him in the hallway, somewhere between his room and our room, sitting ourselves down on the tile for the formal good morning greetings and hugs. "I still can't decide what instrument I want to play in the marching band when I'm big. Or what I want to be for Halloween. Or when I grow up." It's the first thing he says on most mornings, the first words out of his mouth before he lets me know he's hungry or that he needs to use the bathroom. Lowering his cheek into my neck and letting his body fall into my lap for a hug, he sighs. "You have plenty of time to make those decisions, buddy." He thinks it over for a minute -- maybe the trumpet? Or the tuba. Yes, the tuba. Or maybe the drums? Santa Claus is a sweet gig, but Jordan Pundik is another choice. For when he grows up, of course. Halloween, maybe a robot? 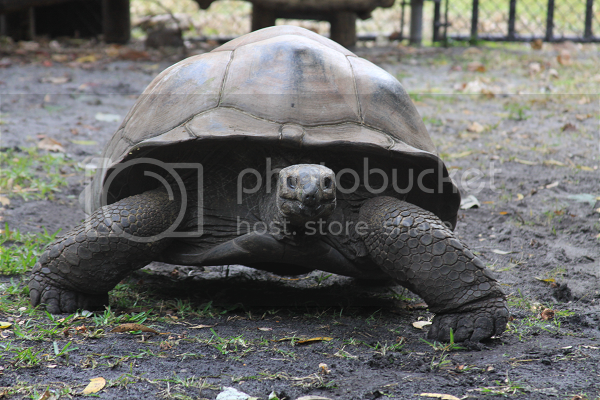 Or maybe a tortoise -- and then gets up to start his day. Some days, these early morning declarations of uncertainty are the only time I'll hear about marching bands or Halloween or future careers. Usually, though, it's the first time of many. I see myself in him often but, really, our need to plan and prepare and know -- really, really know -- what's going on before it happens is one and the same. It's February and I'm already knee deep in guest list preparations and decorations for Ethan's fourth birthday party that isn't until June. 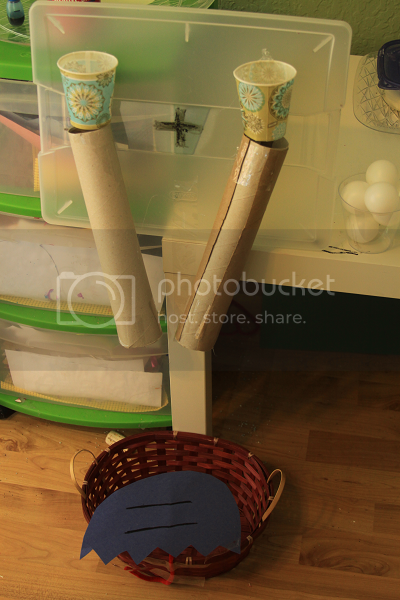 I'm hardly a perfectionist, but there's something that feels really, really good about being prepared. About knowing what you're doing. About not having questions that jump into your mind like a pesky internet pop-up ad when you're trying to sleep. I don't do well with "the unknown" and it appears that my sweet boy has inherited that from me. I'm mostly undecided how I feel about that. At almost-four, Ethan is a master negotiator. He's great at analyzing and planning and collecting. If it's cold outside, we must bring a blanket for his stuffed animal or Lego zookeeper. If it's hot out, how can his plush Smurf visit the park with us without a sun hat? He has such a busy, active mind and a poetic, creative soul and the closest I get to chilling out and relaxing is watching the way in which he exists in a world that has begun to feel more like an alternate universe to me otherwise. He is so familiar in so many ways. 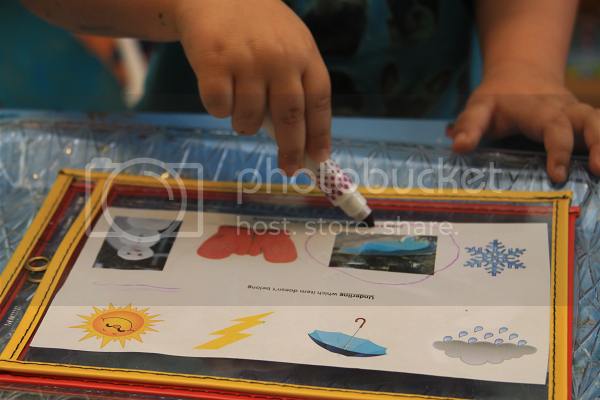 This week was weather week in tot school. 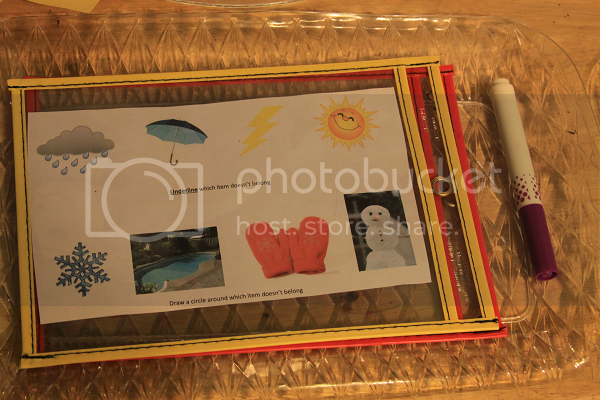 Ethan had been asking a lot lately about the weather, about rain, about clouds and rainbows. Weather seemed like an obvious choice to focus on this week for that reason. 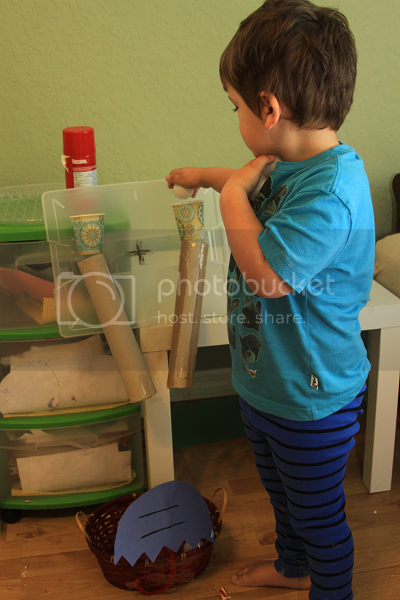 It wound up being a really great week and Ethan was so invested in learning each day! 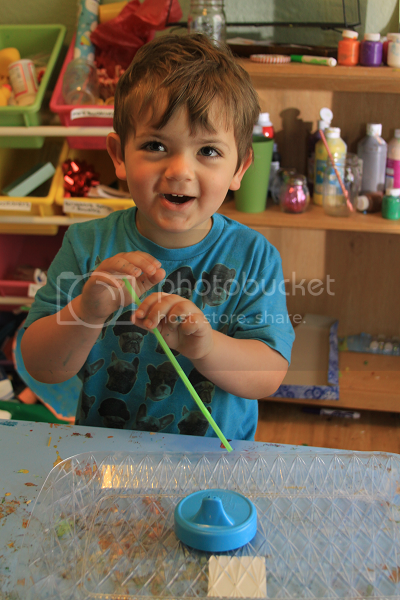 I still let our tot school time be child led, which means we usually spend a substantial amount of time in tot school during a week seeing as how Ethan loves it so much. This week, we spent a couple of hours each day in tot school -- even more than usual -- and it seemed as if Ethan would never tire of the trays and activities! He was so proud and excited to share with family what he had learned this week. I made a few different printables to use in our laminating pouches. 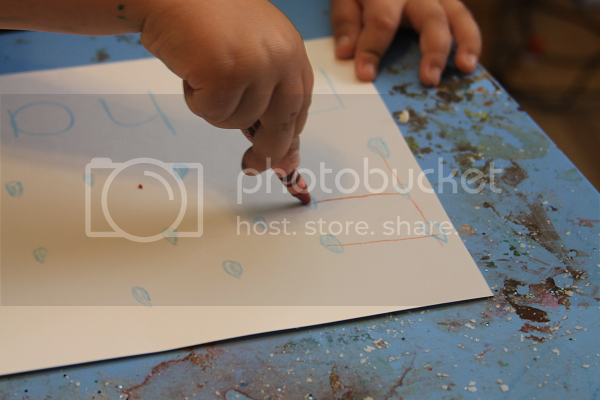 Ethan got to practice circling and underlining the ones that didn't belong. About midway through the week, he began spicing things up by making his own rules -- underlining what did belong, etc. Cutting is a big weakness for Ethan. 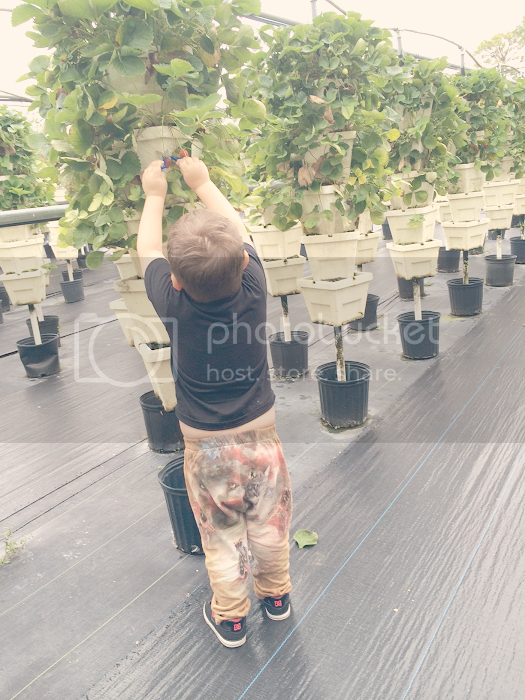 He is always really, really excited about cutting and so determined but we have some trouble. If I can be totally honest, I was always a terrible cutter (I blame being a lefty!). I still can't cut on the lines. Maybe he just takes after his mom! 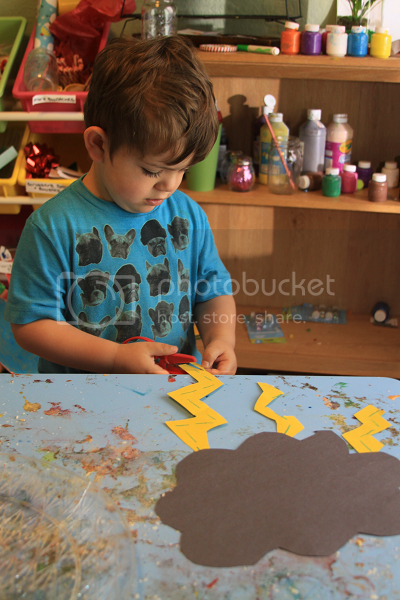 Either way, he had some trouble cutting the lightning bolts along the dotted lines but tried his hardest and was super proud of himself when he finished. 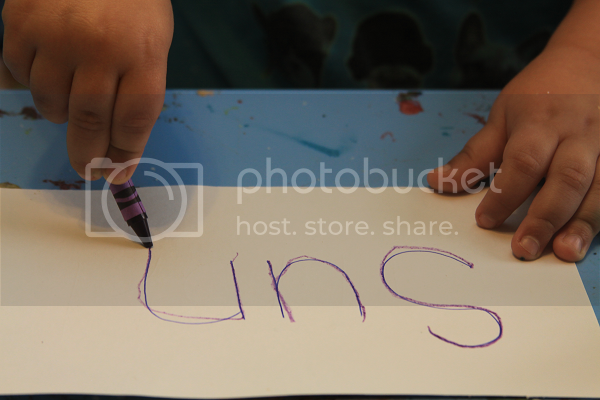 We have been focusing a lot lately on writing and Ethan is really interested in learning how to perfect his letters. Up until now, he's mastered full page letter writing but we've been trying to scale it down and learn how to write neatly and in some semblance of a line. For this one, he got to connect the raindrops to spell out his name. He really loved this one and it offered some critical thinking application as well! I had to draw more of these sheets throughout the week so he could continue the practice. We go to the zoo a lot and Ethan has begun to notice which animals thrive more in cold weather or warm weather as well as which become more active when the sun goes down. I found some salt and pepper shakers - 2 for $1 - at the dollar store and decided to make a fun little fine motor activity to classify these animals. 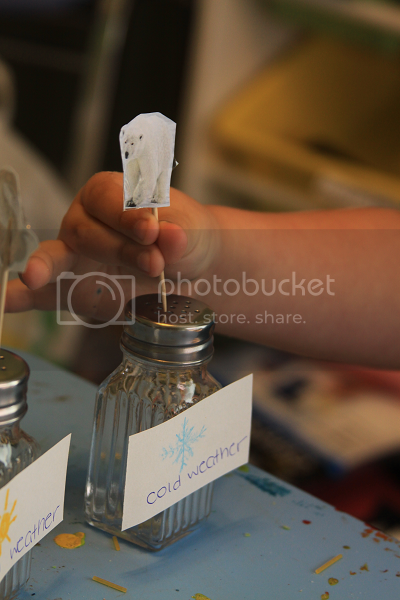 Ethan got to sort the animals into cold weather or warm weather animals and then into diurnal or nocturnal animals. 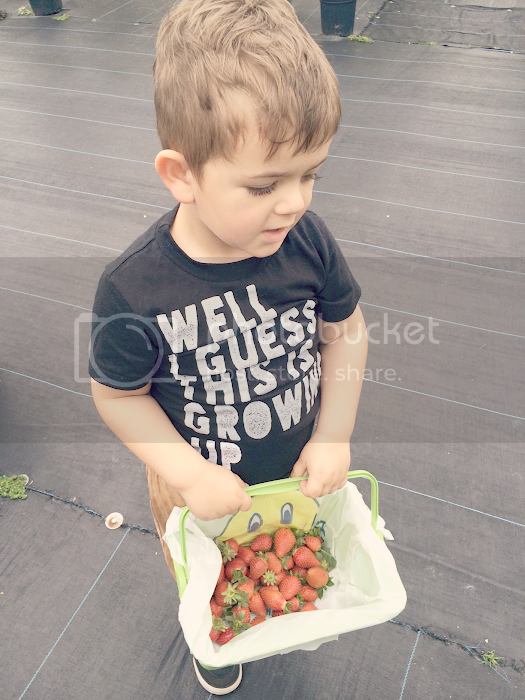 This was hands down his favorite tray of the week! I just had to throw a little Bob Dylan in there somewhere, of course. 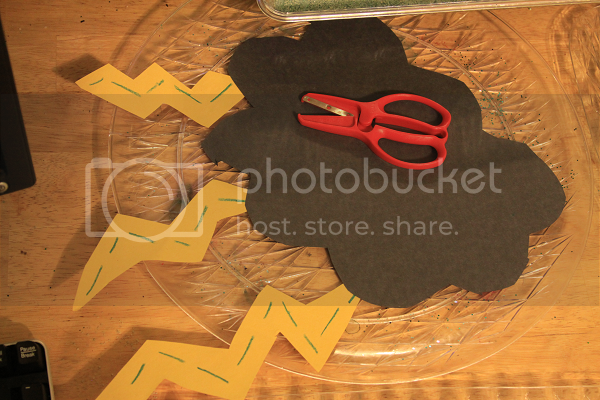 Anyway, the point of this tray was for Ethan to make a hypothesis (and learn the word hypothesis!) about what he thought his wind could blow. This was a total hit like I anticipated for it to be. 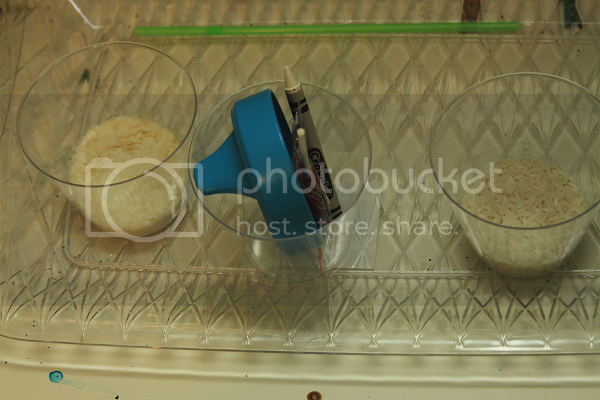 Of course, by Friday, "the wind storm" had blown mashed potato flakes and rice all over our classroom. All in the name of learning, right? 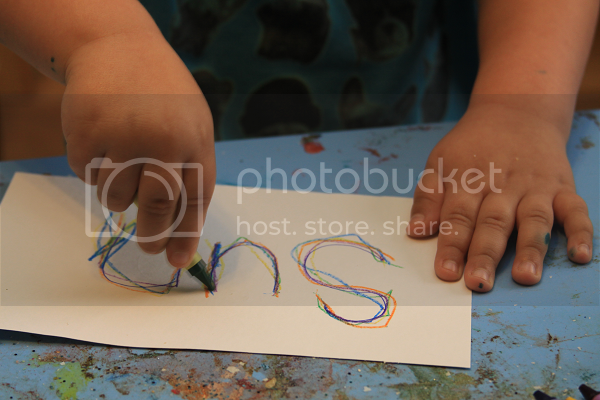 Ethan had been asking about rainbows and the first thing I remembered was rainbow writing, which I remember doing when I was in kindergarten. Mom brain is an interesting thing. 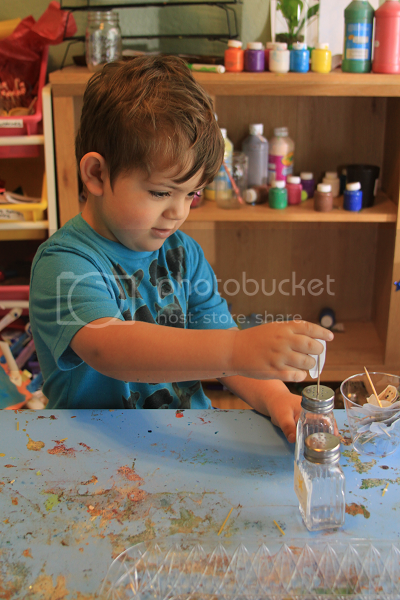 You can't remember what you did ten minutes ago, but you can remember things dating back to kindergarten. 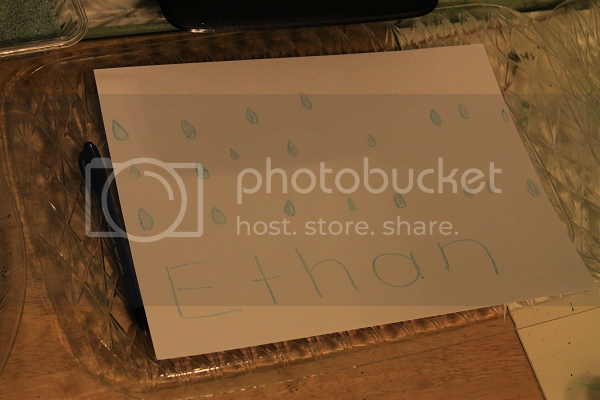 Anyway, I wrote some weather words on card stock and Ethan got to trace them with each color of the rainbow. This made for some colorful and fun letter practice! This was probably his second to least favorite tray of the week, but he still really enjoyed it. The thrill just sort of rain off towards the end of the week. I think I overdid the weather words! I am not a math person. My husband is an accountant who thinks math is fun. Opposites attract, or something. Though he's young, I've already noticed Ethan gravitate towards reading, writing, art and creative outlets and sort of stray away from the mathematical concepts (though you can enjoy both, I get it). This was another one of those times. After crying with frustrating when my initial model didn't work and requiring my husband's help at nearly midnight in assembling this, I was so sure Ethan would love it. He didn't. 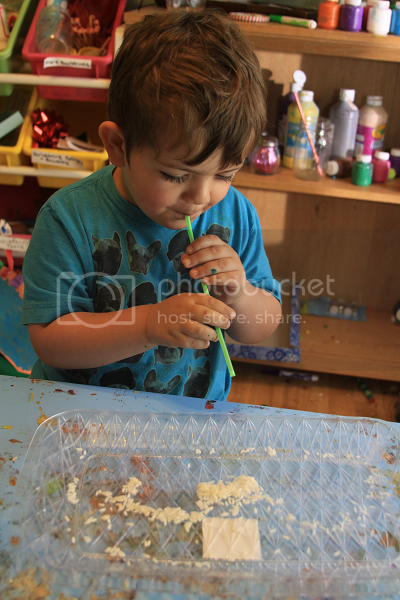 The moment I said "simple addition" and "plus" and "equals," he was out of there and onto the next tray. 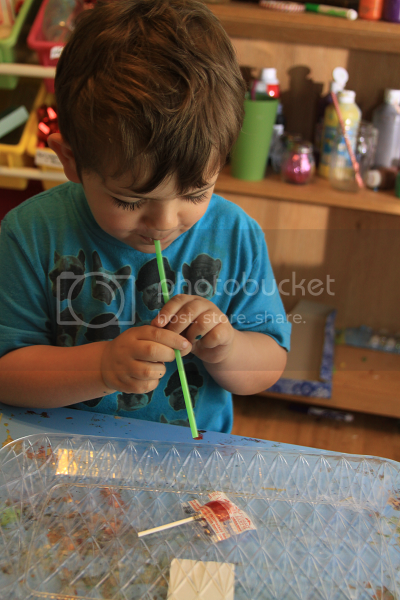 He did insist upon putting the balls through the tubes at least once, but that was it. 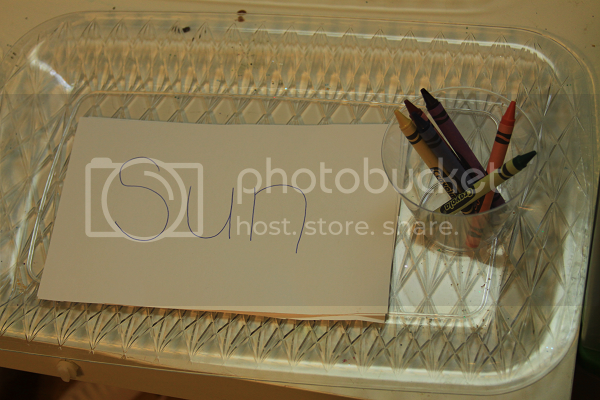 I couldn't convince him to give this tray any use this week! 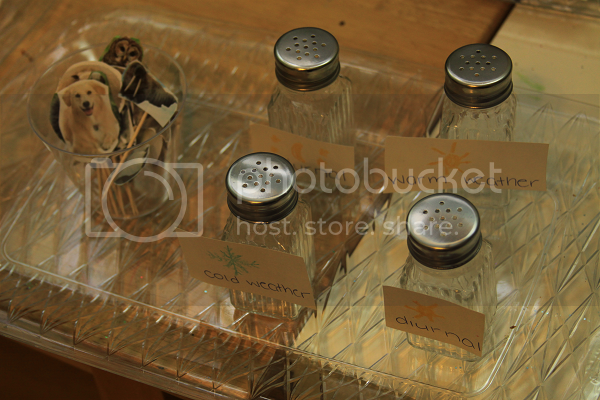 The point of this tray was to add together the pingpong balls -- or raindrops -- and see what they added up to. I may pull this out later and see if his mind has changed at all. 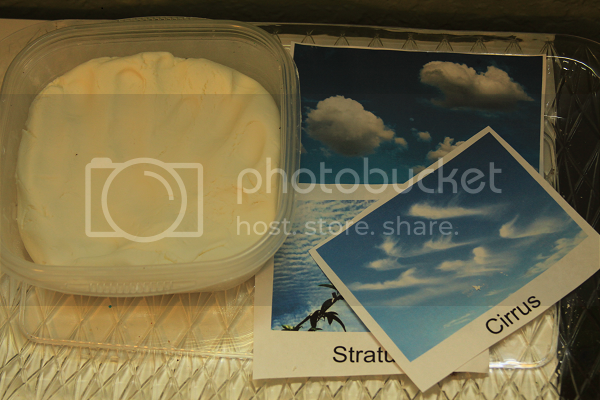 For this one, I made some cloud playdough (1 part conditioner to 2 parts corn starch) and we learned about the different types of clouds. 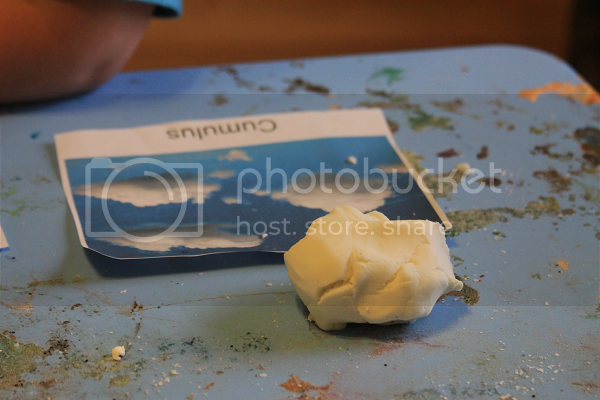 Ethan got to use the cloud dough to recreate the clouds. He loved using his new knowledge of cloud types to try and identify them outside in the sky! 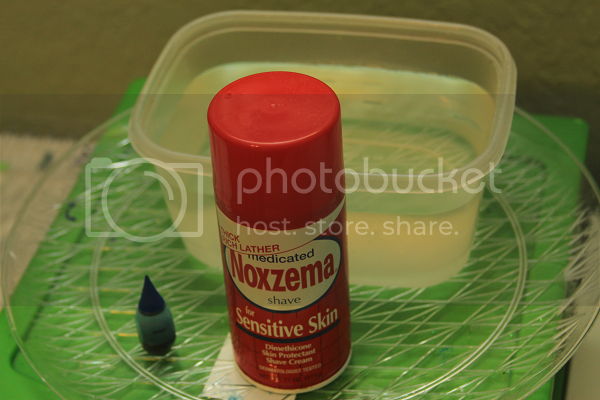 This was such a fun experiment and so easy to do. Ethan absolutely loved it! I picked up some cheap shaving cream at the dollar store so that we could do this over and over again (and, believe me, we did). 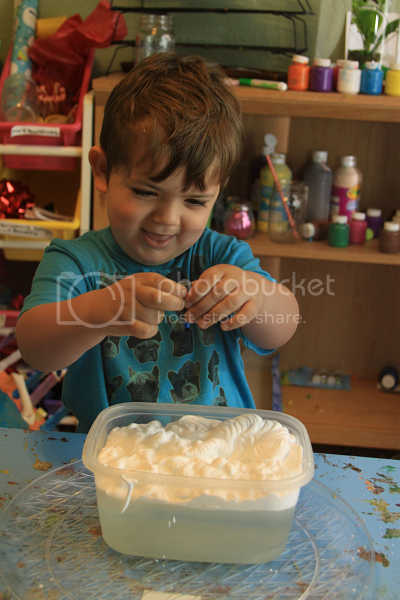 You fill a container with water, add some shaving cream clouds and then drop in the blue food coloring "rain." Eventually, the rain comes through the clouds and you watch a rainstorm take place! 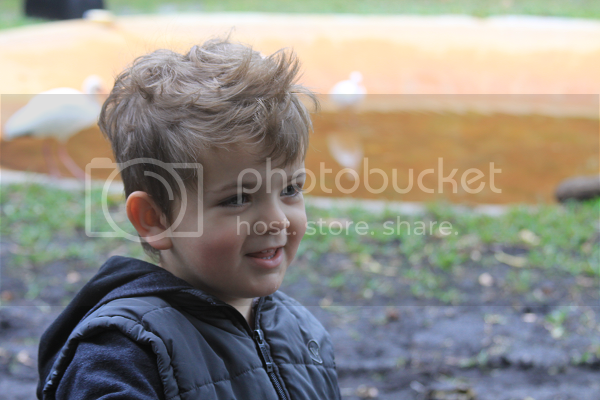 Ethan made the rain more of a drizzle and then decided a full-on rainstorm was the most fun! Ethan and I love the Palm Beach Zoo. If you follow us on Instagram, you've probably noticed we're there a lot -- once a week at least, usually. Ethan and I are on our second year of being zoo members and our special days spent at the zoo are some of my most cherished memories. We're at that point where Ethan knows most of the animals by name and I'm only minimally skeptical of his claims that the Singing Dogs recognize him when he walks up. The Palm Beach Zoo is monumental in our memories and family adventures, so I was really excited to throw Ethan for a little loop and surprise him with a new take on our usual zoo trip. 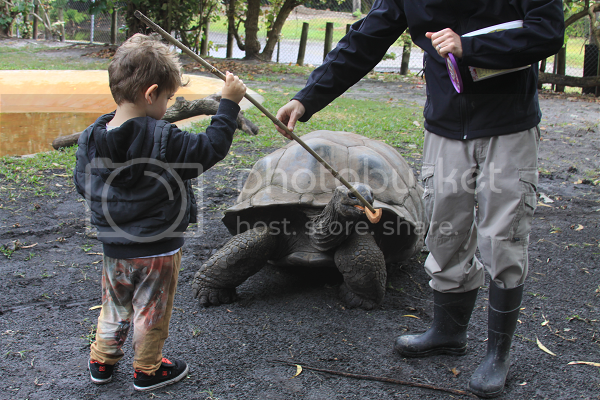 On Wednesday, Ethan and I were able to go behind the scenes and get to interact with the zoo's amazing Aldabra Tortoises as part of the zoo's animal experiences feature. 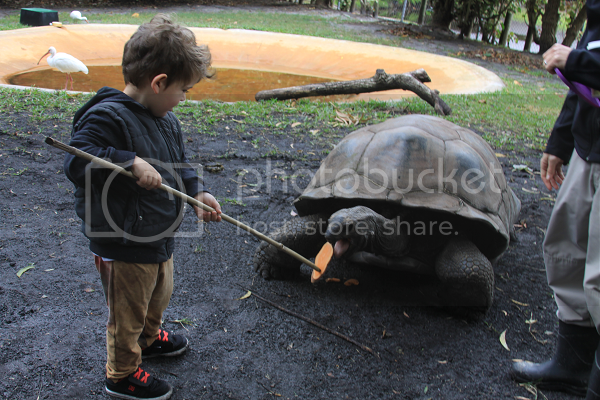 We were met with an off again, on again rain storm and a cold front we weren't expecting, but that didn't stop Noto the tortoise from making quick friends with Ethan. Seeing the glimmer in Ethan's eyes as he excitedly waited to feed and pet Noto made me forget all about how chilly it was for our South Florida blood. Many people have negative perceptions when it comes to zoos. The Palm Beach Zoo does a good job at squashing the negativity in one visit. No, you won't see whales or penguins or elephants or other animals that couldn't possibly thrive in our South Florida temperatures or in limited space, but you will find an ethical zoo with zookeepers who love every last animal as if they were family (and, if you ask Ethan, Mardi the white alligator is totally part of our family at this point!). 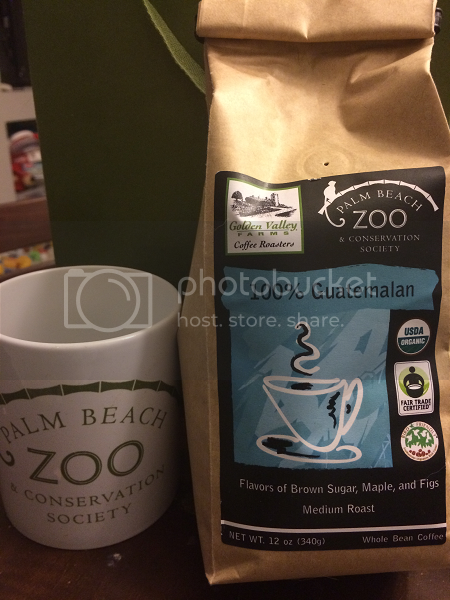 The Palm Beach Zoo is all about conservation and sponsor many conservation programs as well several on site programs. (We even learned the animals get acupuncture treatments which is just about the coolest thing ever!). 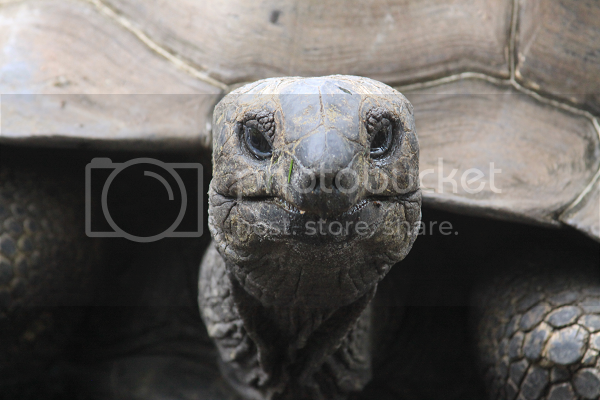 The love the zookeeper had for Noto and the other tortoises was so apparent from the moment he began talking to us. Not only did Ethan and I get to experience these beautiful animals up close and personal, but we learned so much in our time with them. 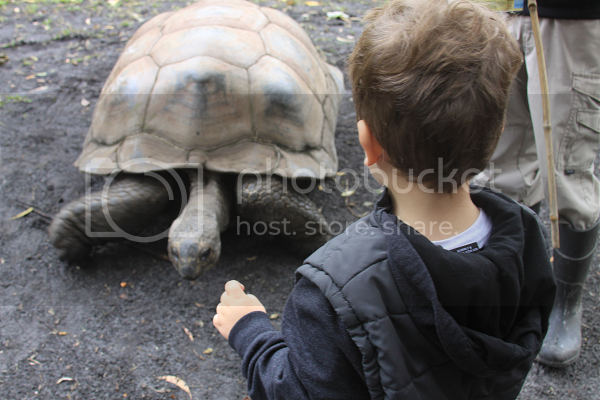 Through talking with the zookeeper, Ethan learned the differences between tortoises and turtles as well as what tortoises liked to eat, how the weather can affect their digestion and activity and how old they can live to be. 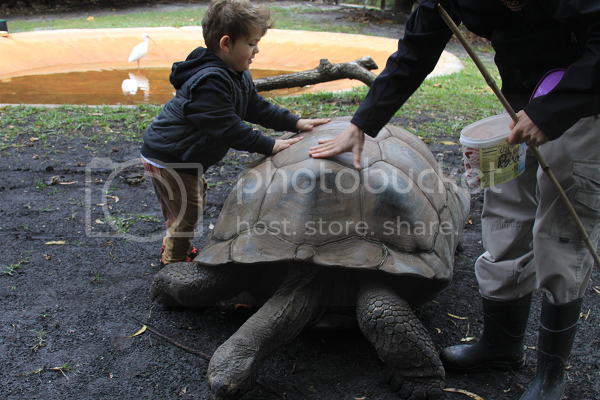 He also learned that tortoises can feel you touch their shells, so it is important to always be gentle when petting them. 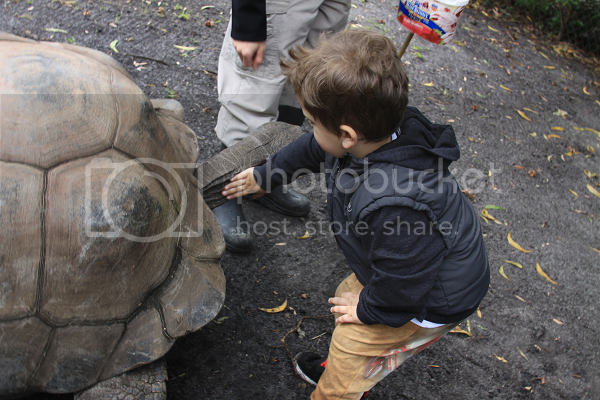 Perhaps his favorite part was being able to feel the skin on Noto's head and neck, not just his shell. I like to say I'm a "homeschool nerd" who advocates for the importance of play as a learning tool. In the same sense, children learn so much from the world around them. In his short visit with Noto, Ethan was able to take away so much knowledge and experience -- more than we give children credit for. It was a completely magical visit and I am so honored to have had the experience alongside Ethan to meet Noto up close. When I get to be Noto's age (humor me), I still will never forget the glimmer and excitement in Ethan's eyes as he stood in front of Noto for the first time! Ethan has also decided that he's going to be Noto for this year's Boo At The Zoo, so I've got my costume-making work cut out for me. 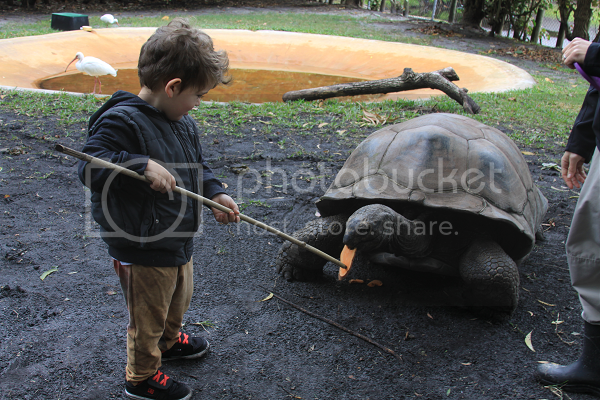 For more information on the Aldabra Tortoise experience, check out the zoo's website! A particularly fun new "zoo fact" is that the zoo is planning a new eco-friendly garden to grow fresh food for the animals. Twice a month, the zoo also has a fresh produce market where zoo goers and South Florida residents alike can do some shopping. Perhaps my favorite new addition to the produce market is the zoo's new coffee. With a commitment to sustainability, to the animals and to education, I simply have no choice but to fall in love with the Palm Beach Zoo a million times over each time we step through those front gates (which is a lot). The folks at the Palm Beach Zoo also graciously offered one of my readers the chance to win a family four pack of passes to the zoo! Enter below and, if you decide to give Noto a visit (and I would totally encourage you to do so), tell him his buddy Ethan says hello! One of my favorite things about the holidays are the themed books. Ethan and I love making early morning trips to Barnes & Noble to read them all. Old favorites that exist already in our home library and new ones that become a favorite before we even finish them. Because it's almost Valentine's Day which has always been one of my favorite holidays, I thought it was only fitting to compile a list of our favorite Valentine's Day titles! Ethan is on a Snoopy kick. He and my husband must have checked out every Snoopy book in the library, but this was a new one for him. It's a cute story (am I the only one who is always rooting for poor Charlie Brown?) with flaps to lift as you go. Always the George fan, this one has topped Ethan's favorite Valentine's Day book list for the past couple of years. It, too, is a lift the flaps story about Curious George and the Valentine's Day party he throws for his friends. Ethan really loved the illustrations in this book. It's a sweet story about how there's someone for everyone -- a kiss for everyone, rather -- from ants to elephants. This is a sweet story that isn't specific to Valentine's Day, but is all about love. The underlying message of this story is that you can't outgrow love, or go far enough away where love can't reach you. Love is always with you. This is a beautiful story all about the shape of love. Ethan loved the illustrations and pointing out the shapes he could recognize as the story went on. This is a beautiful story all about unconditional love. Again, not specific for Valentine's Day but perfect for reading while snuggled up with your little valentine. This one will tug at your heart, I can guarantee it. There's a gold and silver foil trend going on right now and I love it. This book contains gold foil that brings so much life and warmth to the beautiful illustrations. It's a sweet story about a mother's unconditional love. This one is always a classic, not just on Valentine's Day. Still, it's the perfect addition to any Valentine's Day book list. Such a sweet story about the connection between parent and child. Ethan and I discovered this title last year on a Valentine's Day display and instantly fell in love. It is a story we read tirelessly throughout the year, but was the first title Ethan sought out when we walked into the bookstore. It's a beautiful story of love finding you, of never losing hope, of staying true to yourself. The illustrations are gorgeous and unique and, well, we think Love Monster should be on everyone's bookshelf at home! Do you have a favorite Valentine's Day children's book?